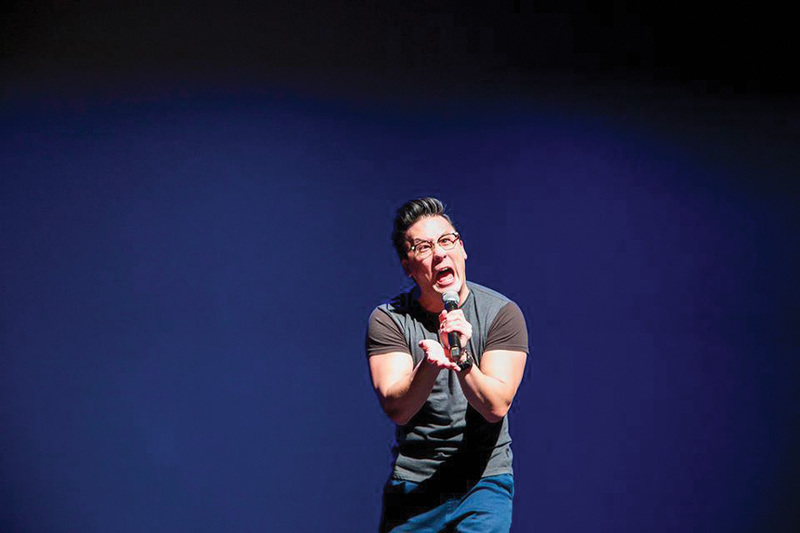 Comedian Eliot Chang performs at Celebrasia: Year of The Monkey. The Chinese Students Association and Taiwanese American Students Club issued a letter of apology Tuesday after receiving complaints that Chang’s act was offensive. Following concerns about comedian Eliot Chang’s comedy routine at Celebrasia on Saturday night, leaders of Northwestern’s Chinese Students Association and Taiwanese American Students Club released a statement Tuesday apologizing for any discomfort, anger and hurt students might have felt. The statement was released in response to students posting on social media that they were offended, a sentiment organizers shared, said Chinese Students Association co-programming chair and Weinberg sophomore Kimberly Chow. Although the overall show was well received, Chang’s routine, which incorporated jokes that could have been misconstrued as sexist, crossed lines at multiple points, said Chinese Students Association internal president Jonathan Lo. The Weinberg senior said although there were people laughing, there was a general feeling of uneasiness. Chang said although some students conversed with him about why they did not appreciate his routine, many still told him they enjoyed his comedy. In addition, Chang said he performed the same routine at the University of Oklahoma, and there were no complaints. Anane told The Daily she noticed many people in the audience were uncomfortable, adding that the routine differed from most other comedy shows because it was not clear that Chang knew what he was saying was sexist or politically insensitive. The Celebrasia organizers should have done more research on what Chang would say and how he would perform before bringing him onto campus, Anane said. Their inviting him made it seem as if the organizers agreed with his content even though that was not their intention, she added. Anane also said the routine’s offensiveness should have been addressed at the show in the moment. However, Leo Zhu, Chinese Students Association external president, said responding at the show was not feasible. Chang said some people took his comedy too literally. He pointed out that a video shown during Celebrasia depicted a girl being thrown off the roof and a boy being stabbed, and he argued that the video, which implied murder, assault and battery, should have received a stronger reaction than his jokes did. The goal of Celebrasia is to promote Asian-American awareness and inspire those in the Asian-American community at NU, Chow said. Lo said he didn’t think Chang’s performance should take away from the success of the rest of the show, which sold out the entirety of Cahn Auditorium for the first time this year.